This is second in the series – “India At 70”. It is about article 370 in our constitution that has given autonomous authority to the state of J&K. It is another self-created problem that we shouldn’t have continued with for so long. For a prolonged time it has remained the talking point in both our political/democratic as well as public discourse. Some time back one of my readers asked – what is my opinion on article 370? I am no constitutional expert, I replied. For me, article 370 is a glaring example (among many) of yet another democratic mismanagement by our forefathers. 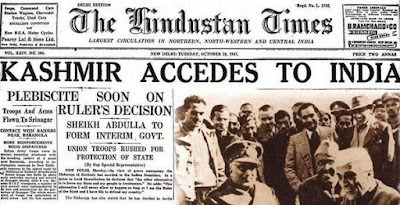 Much like the ‘Muslim personal law’, our forefathers left the guideline of the accession of J&K to India with lots of ‘ifs’ and ‘buts’, that unfortunately has come to hound us of late. 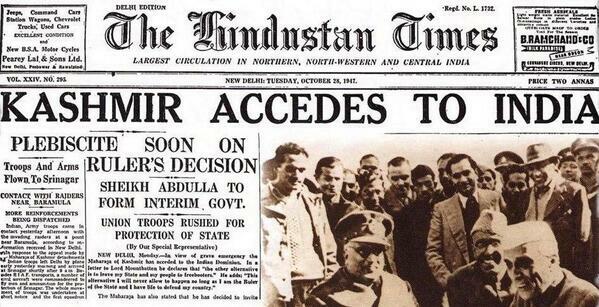 I blame the lack of foresight back then that resulted in a never ending (so as it appears) mess like article 370. A mistake born out of thoughtlessness has left generations after generations to pay through their noses to just maintain the status-quo, much less bringing about the desired changes to get rid of it. We all are aware how big an evil it has turned out to be in terms of our national integration and we will only fool ourselves if we still claim that it doesn’t affect us as a state directly or indirectly. Now the question arises; why did we tolerate this mess for long seventy years? Why no political party ever tried to fix this problem proactively? And I blame every political party that assumed office after independence. As I said, the clear and present danger vis-à-vis article 370 is too glaring for one to fringe ignorance. There has to be reasons why no government tried constructively to get rid of this menace. Beyond shouting to garner few political brownie points, there were no sincere efforts put forward to fix the problem that our forefathers left us to fix. BJP did made article 370 a talking point again when they added it to their 2014 manifesto. And as gullible as we common populace could be, we thought it to be at par with 'Triple Talaq' as far as a problem statement is concerned. But is it as easy (or as difficult) as ‘Triple Talaq’ to fix? People may question BJP on the steps they have taken to fulfil this vital poll promise, but I, as an individual, never gave pre-poll political promises too much weight. These are routine gimmicks that political parties throw at us because they believe the voters are genetically and to even some extent pathologically stupid. Had we been so serious about what we were promising to the voters before election, we would already have been a superpower a long time back. Even the ‘Left’ chaps promised to make Kolkata another New York and we all know where the state of West Bengal has ended up at. Well, what BJP did or didn’t do after assuming power on their promise of abrogating article 370, we will discuss in the due course of the post. But before that, is repealing article 370 that easy; or at least to the easiness level that we all think it to be? Let’s see. This is a short history of the article 370. The above paragraph talks about the ‘why & how’ this mindless legislation was brought in at the first place. In which form it was brought in, we would see little later. Now here the matter of interest is the time period that this legislation was suggested to exist. It says the said legislation is for a temporary period. Now the question arises; how it then managed to survive so long. The answer to which is there in the legislation itself. Here the ‘constituent assembly’ of the state has the authority to call the shots. Ironically the constituent assembly of J&K was dissolved in 1957 without recommending either abrogation or amendment of article 370 in our constitution. This resulted in the article becoming a permanent feature in our constitution. This also has been confirmed by various court orders that cited the nonexistence of a ‘constituent assembly’ as the reason for no solution but to continue carrying the bogey as is. Could I guess a foul play here in the manner the constituent assembly was dissolved without taking this vital issue to any kind of conclusion? A little throwback on the history of 1957 and the kind of people that were governing J&K back then, I can only smell sabotage by choice. I don’t want to believe that such an important legislation could miss the discussion table before dissolving the sole authority who could take a call on this. So I can safely say, and I stick my neck out to say so; by design the article 370 was shoved down our throat by the nefarious design of the state in conduit with the centre of that era. That said, what has been done is done. Can we fix it, if at all? The answer is both yes and no. At the same time it isn’t as helpless as it looks on its face value. The solution could be found in the article itself if we try to read between the lines. So as the starting point, let’s see what the article looks like in its entirety. Such other matters in the said Lists as, with the concurrence of the Government of the State, the President may by order specify. Such of the other provisions of this Constitution shall apply in relation to that State subject to such exceptions and modifications as the President may by order specify: Provided that no such order which relates to the matters specified in the Instrument of Accession of the State referred to in paragraph (i) of sub-clause (b) shall be issued except in consultation with the Government of the State: Provided further that no such order which relates to matters other than those referred to in the last preceding proviso shall be issued except with the concurrence of that Government. If the concurrence of the Government of the State referred to in paragraph (ii) of sub-clause (b) of clause (1) or in the second provision to sub-clause (d) of that clause be given before the Constituent Assembly for the purpose of framing the Constitution of the State is convened, it shall be placed before such Assembly for such decision as it may take thereon. Notwithstanding anything in the foregoing provisions of this article, the President may, by public notification, declare that this article shall cease to be operative or shall be operative only with such exceptions and modifications and from such date as he may specify: Provided that the recommendation of the Constituent Assembly of the State referred to in clause (2) shall be necessary before the President issues such a notification. If one looks at the article in detail the first thing that would strike you is the overwhelming capabilities of the ‘constituent assembly’, which now is non-existent, that could play a spoilsport in any attempt of the central government to take over. It talks about article 238 too. Could this be the door that we could sneak in? Unfortunately no. And why it is a NO? Because article 238 is already repealed a long time back. But yes, the amended/removed article 238 still plays a vital role and could give us a way forward. This very article was enacted for all princely held states who wanted to join India. But surprisingly 238 wasn’t made applicable to the state of J&K. Even more surprising, article 238 was repealed exactly a year before the constituent assembly of the state was dissolved. To our utter despair, now we don’t even have article 238 with us to amend and add J&K to it before taking article 370 head-on. Here too I suspect foul play as the very article which could have given straight forward ways to fix article 370 is gone too. But is it the end of the road? What else we are left with to fix the problem? Let’s see. Could we just go to the courts and get this horrendous segregation in our constitution out as we did in case of ‘Triple Talaq’? We could but it won’t yield in much. Honestly, if we look at our court orders over the years on article 370 it won’t encourage us much either. It is not that the matter hasn’t gone to the courts yet. It has gone multiple times and each time the courts have refused to partake in legislation and rightfully so. As early as 2015, the J&K high court threw the petition out citing their inabilities to preside over our constitution. The change should be made in accordance with the legitimate procedures of democracy as subscribed by our constitution, the learned judges pronounced in their judgment. But they added a caveat in their judgment – there is no amendment possible to article 370 since the other party to the claim, i.e the constituent assembly cease to exist. Frankly the way through our legal system seems a farfetched idea to give us any kind of results here. It has to be the legislative way as the courts suggested. President can repeal article 370 if he/she deemed it fit democratically. But can the president act on his own; without the consent of the constituent assembly of the state, which no more exists? Yes and no again. President can act without the consent but no president would do that fearing the backlash he/she would receive for jumping the outlined procedure, though it is very much within his democratic rights. President would only act if both lower and upper house pass a law. But as the J&K high court judgment goes, no amendments to article 370 is possible. What the central legislative assembly could do when the amendment option is already taken off the table? Not much except may be passing an amendment to sidestep the J&K high court ruling as was done against the Saha Banoo judgment of the Allahabad high court. But would that set a wrong precedence, both with our legislation and judiciary? Of course it will and someone at the top need to bite the bullet, though it won’t be that easy convincing people, both inside and outside of his/her party. The way forward to get rid of this mess isn’t that simple as we think it to be. Individually, both our judiciary and our legislation can’t get rid of this on their own. It has to be a joint effort. Judicially the government must approach the Apex court to overturn the 2015 ruling of the J&K high court. That should be the first step. If there is a favourable judgment from the Apex court, the road ahead would be little easier. In event of our Apex court over ruling the earlier judgment, our legislative assembly should be convened to get rid of the clauses in article 370 that gives unobstructed decision making power to the J&K constituent assembly. They may not get rid of the state’s involvement totally but they can very well replace ‘constituent assembly’ with the now functioning ‘legislative assembly’ of the state. Making these minor changes won’t be that difficult as many constitutional experts believe. Third step in this endeavour should be to take the state assembly in confidence and I don’t think there would be any more favourable environment to take the state government on your side than what it is today. When there is a partnership that is ruling the state with BJP (who support abolition of article 370) at least half of the consent required from the state representatives is achieved. Knowing PDP and NC and the way they have built up their politics on article 370 over the decades, it won’t be that easy to make them agree to come on board but it is worth of an effort nonetheless. I even won't mind if PDP is arm-twisted somewhere in-between to tow the lines, and I am sure, there are enough avenues to arm-twist PDP. Bigger problem would be if our Apex court agrees to the lines of J&K high court. It would almost shut down every door. It would immediately be a case where no more judicial solution/help possible. It has to be legislative approach all through. There could be review petitions filed but that hardly would change the decision in favour. In event of a rejection at the hands of our Apex court, the only way possible is to repeat a Saha Banoo and set aside the judgment as I mentioned above. Criticism would be plenty but that is the minimum one should be ready to take to get rid of a bigger malice. We can’t afford a state within a state. It has huge financial burdening as well. Lest we forget the democratic and legislative implications that we are managing since last seventy years. If this menace has to go, it should go. And no wonder it would require immense political will to act decisively here. But is the present BJP government ready to bite the bullet? As part of their manifesto BJP has tried to take the judicial route post their win in 2014. They had some political support across party lines on this as well. In September 2014 BJP along with RSS filed a petition with the J&K high court to look at their plea. But that effort as I told fell flat. In a ruling that I consider as a huge setback to the whole movement, J&K high court not only did refuse to arbitrarily supersede the constitutional framework but also ordered that there could not be the existence of a chance where article 370 could even be amended. It could not be abrogated, repealed or even amended, said the honourable high court in its judgment. Since the Constituent Assembly did not make such a recommendation before its dissolution in 1957, the Article 370 has taken on the features of a "permanent provision" despite being titled a temporary provision in the Constitution, the court added. And after this setback I haven't heard anything from BJP quarters vis-a-vis article 370. So let’s not mix the success of ‘Triple Talaq’ with abrogation of article 370. Both are two different things in their own way. Repealing article 370 isn’t that straightforward and it never was. It has to be a joint effort of many institutions that may just make it possible but it would be a huge effort. Someone has to do the heavy lifting and certainly courts wouldn't come to our rescue here. The effort required should be consistently spread over a period of time. As I said, the path ahead isn’t easy and even then, it is no guarantee that we would be successful in getting rid of this malevolence after all our efforts. Honestly, I would be greatly surprised if this is achieved within the tenure of the present dispensation.